This is Donald Hall’s sixteenth collection of poems in six decades, although he has also published books of prose—including three memoirs—and edited several anthologies. A graduate of both Harvard and Oxford, Hall’s education prepared him well for a notable career as a poet, and that he has had. Born in 1928, he has also been an editor and interviewer (most notably at Paris Review) as well as an interviewee, questioned by Peter Stitt for Paris Review in 1991, and more recently by Garrison Keillor on Minnesota Public Radio, sitting beside Robert Bly, Hall’s fellow poet and lifelong friend. Hall has also been an academic, the longest stint at the University of Michigan, where he met Jane Kenyon, who became one of his most gifted students and his future wife. peppered the casserole cookery of middle youth. And sport attested: We are alive. into the calm and receptive waters of the Neva. surrounded Leningrad and the implacable Neva. inland from the former St. Petersburg’s Neva. and starvation ebbed by the enduring Neva. Poems such as this do not spring from mere reading, but from the inscape of traveling and from imbibing, then distilling, one’s own life in perspective. Keats never did pick up his MFA. 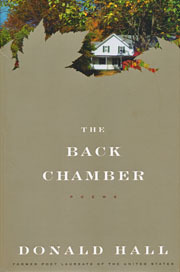 The Back Chamber has unexpected insights, charms, droll observations, self-mockery, and well-earned wisdom. Hall is a serious writer, yes, but he has learned not to take himself too seriously—a view many a younger artist might embrace.